Chico's has a new summer offer available where you can purchase everything with discount. 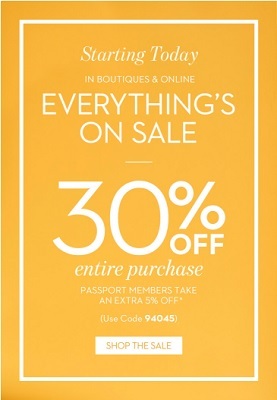 Don't hesitate, visit your nearest Chico's store location in the U.S. or Chico's online and get 30% discount on everything. Passport members save even more money! They can get another 5% discount on everything. To receive this offer in-store print a special email, to receive the offer online use online promo code at checkout. Source of the information is Chico's. For more details visit Chico's store or Chico's online. Offer valid now through 06/19/2016.